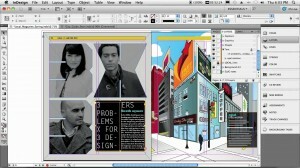 Adobe InDesign is very popular amongst professional designers and graphics production artists. Adobe InDesign is a page layout software that integrates perfectly with Photoshop, Illustrator, Excel, Acrobat and Dreamweaver. This Adobe InDesign training course is suited for those who wish to acquire the necessary skills to create periodical publications, advertisements or illustrations destined to print media. A course in Adobe InDesign will enable the students to effectively use the Adobe InDesign tools, to comprehend the graphic charters, to work with text and image and to get acquainted with typography. This training course aims to enables the participants to understand and use the desktop publishing software InDesign. The students therefore develop an effective work knowledge of this software application in order to create printed documents. This private training in Adobe InDesign really meets your needs and offers the opportunity to expand your knowledge at your own pace. The flexible schedule is planned in accordance to your availability.